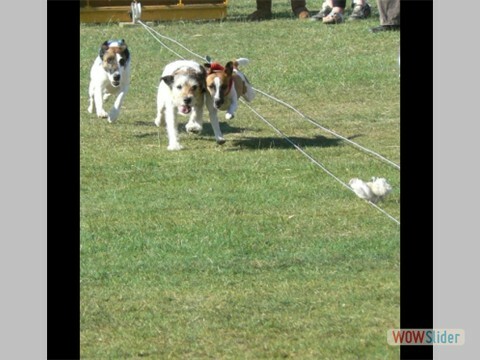 Once again there will be terrier racing at Walton May Pageant at the Howard Close Recreation Ground, Walton-on-the-Hill. Last year many owners took the opportunity to get their terriers limbered for the big day Omni Terrier Derby. The races were generously sponsored by local businesses with all proceeds going to the Walton Pageant charities. We are very grateful to the following supporters: SCG Flooring, Farm Fencing, Equestrian Country Store, Jessica Rea Millinery, Windmill Farm Kennels & Cattery, Walton Salon and Tadworth Tyres. For more details email bob@terrierderby.com or call 07979 605579. Omni are again proud to sponsor the Terrier Derby to be run at the actual Derby course - click for map. An hilarious spectacle for audience and participants alike with a parade of champions where previous winners strutted their stuff on the winners' podium before battle commenced. If you have a terrier(s) up to 15” at the shoulder then bring them along or just come and enjoy the fun with the Terrier Racing set. Owners can pre-register their terrier by emailing bob@terrierderby.com or register on the day at the registration tent. Entry costs £2 per terrier (all proceeds to charity). PS: plenty of parking in adjacent car parks; refreshments available and toilet facilities are just metres away.